The sudden flowering of the percussion family as instruments worthy of serious musical expression was one of the great developments of music in the first half of the last century. And given the wonderful repertoire that burgeoned in that time (and for many years after) it’s not surprising that the world is now full of stunning ensembles willing and able to perform the masterworks of the genre. 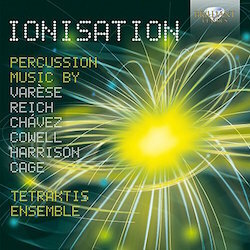 This recording contains at least two of the most important works in the literature; Varèse’s Ionisation and Cowell’s Pulse. In a sense, these two masterpieces delineate very clearly the areas composers could explore; Varèse is principally concerned with timbre and texture, while Cowell’s piece is chiefly about rhythm (though timbre, too, naturally plays an important part). It is also very striking that four of the works recorded here were composed within a period of three years or so. As the booklet notes point out, we have four American composers (Reich, Cowell, Harrison and Cage), a Mexican, and a Frenchman who took American citizenship. This last is of course Edgard Varèse, one of the true authentic originals of 20th century music. He wrote of Ionisation that it represented ‘….the mystery of the skies of America’. I’ve always found it a vivid urban landscape, with those screaming sirens conjuring up the brutalist architecture, the traffic, the sometimes hostile, violent atmosphere of the Manhatten where Varèse settled when he arrived in the US in the 1930s. The Italian ensemble Tetraktis deliver their impressive credentials in Varèse’s short but epoch-making piece. Not only are they alert to every detail of the music, they have selected their instrumental tones carefully; the lower of the two sirens, in particular has a disturbingly human vocal tone, howling out as it does over the fragmented percussion sounds. Steve Reich’s Music for Pieces of Wood was inspired by his in-depth study of African music, and is a close ally of his Clapping Music of the previous year. But, although it is of course hypnotically repetitive, it is a more rewarding listening experience than the earlier piece, because Reich, having set in motion his multi-layered ostinati allows them to become a background against which other more isolated sounds are thrown into relief. Carlos Chavez’s Toccata can be seen – again as hinted by the excellent booklet notes – as a reflection of the three-movement classical sonata pattern – quick – slow – quick. But of course, that is far from the complete picture, and this is a fascinating and subtle work, whose middle movement features the most magical use of tuned percussion. Cowell’s famous study in 7-time (surely the finest piece to have been written during a prison sentence?) is done superbly, as is Lou Harrison’s Song of Quezalcoatl; but it was John Cage’s Third Construction that I found the most stunningly memorable piece on the disc. The conch-like call that sounds out two thirds of the way through made me think of this piece as a counterpart to Lord of the Flies, for it shares with Golding’s novel a slowly evolving yet explosive violence that is quite brilliantly realised by this fine ensemble. The sense of shock when the piece crashes to its sudden conclusion says it all. Each of these works is a masterpiece in its own way. This is a beautifully conceived and executed programme; congratulations and thanks to all involved.